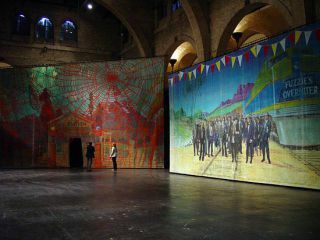 Over his 30-year career, Wallinger has represented Britain at the Venice Biennale in 2001 and was awarded the Turner Prize in 2007 for his installation, State Britain. Wallinger’s sculpture Ecce Homo was the first project chosen for the Fourth Plinth in Trafalgar Square in 1999. 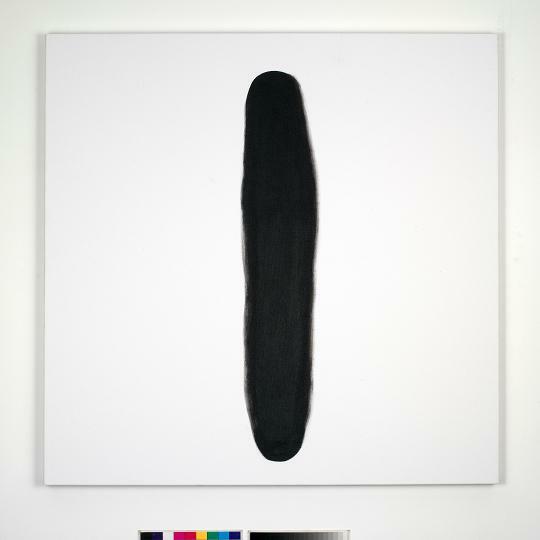 For his exhibition in Void, Derry, Wallinger will show a number of paintings from an ongoing series of Self Portraits. 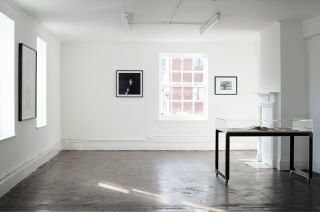 Also included is his feature length video installation, Construction Site (2012) and Shadow Walker, another recent video work. The works demonstrate Wallinger’s ability as an interlocutor between the everyday and the intangible, with an eye for the overlooked, and an astute philosophy addressing relationships between the micro and macro/ politics and art. 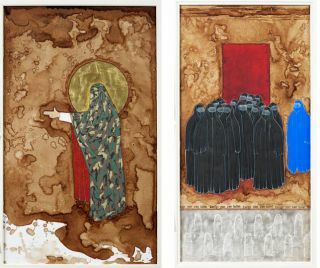 Each body of work presents the viewer with a conundrum questioning how we categorise and understand the world we live in, offering observations, not answers. Wallinger encourages the viewer to look for the sublime in our contemporary existence, drawing upon a dichotomy between nature and culture he instigates a self-reflexive pause amidst a modern spectacle of chaos. Exhibiting in Derry, at a time when a city attempts to ‘rewrite its history’, publicly through a cultural agenda, Wallinger’s approach to art-making and its critique of identity and self becomes particularly apt. 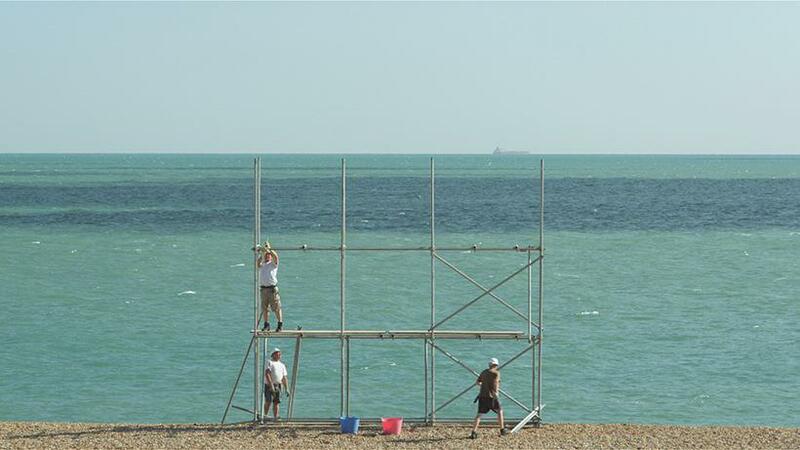 Construction Site shows a team of scaffolders erecting and then dismantling a structure set on a beach. Against the backdrop of the pebbled shore and the sea, the structure rises until the top level is aligned with the horizon. Wallinger draws attention to the construction of structures that are usually disregarded, yet are undeniably pivotal, viewing construction becomes a double entendre for looking at how the viewer constructs. Wallinger begins to frame a scenario between profound abstraction and simplistic reality. Questions of framing and context are put under observation and the work of the labourer whose regular activity builds the physical structures of our society, is here turned into a balletic performance where function leads to a moment of magic. 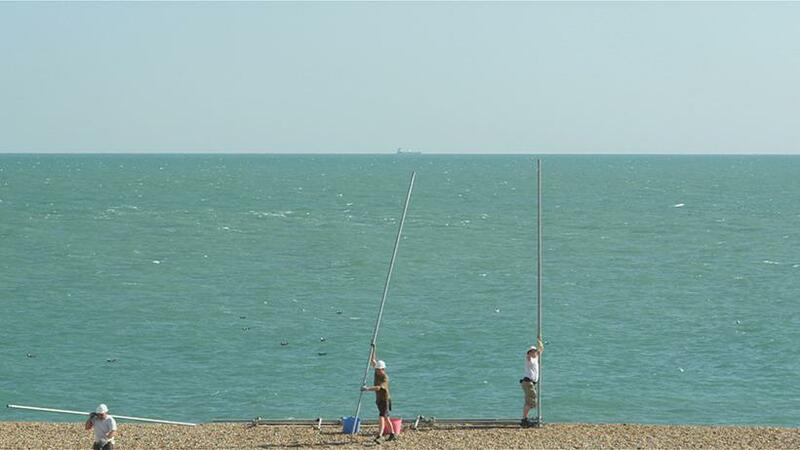 For, at the zenith of their performance, the three unknown labourers step onto the top of the structure and, hovering on the surface of the horizon and land, momentarily become like gods astride the earth, before they return to their labours and dismantle the structure, leaving the beach and the view empty once more. 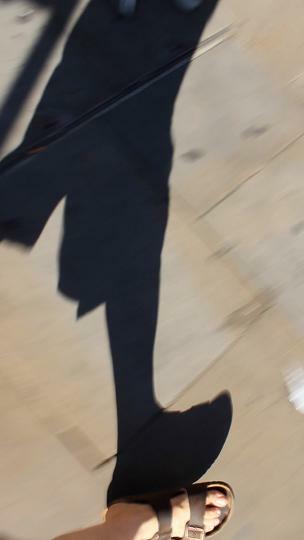 Wallinger records himself walking down Shaftesbury Avenue, London. 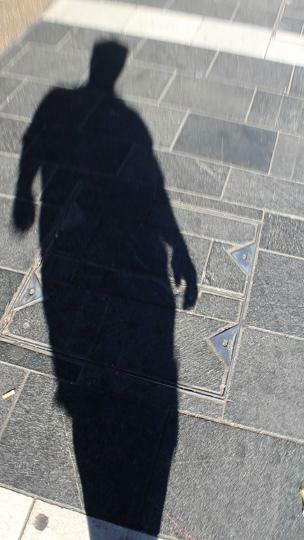 The three-minute, looped video shows the shadow of the artist proceeding down the pavement, his body morphed and transfigured due to the angle of the camera referencing a disembodied artist or fragmented identity of the individual when placed in the ‘public’. This exercise allows the artist to experience the city in the tradition of Baudelaire’s flaneur or absorb the freedom of anonymity expressed by Robert Walser in his prose. The Self Portraits consist only of the letter “I”, as a capital or small letter, in different fonts, in this case all freehand inventions, and painted on canvas. 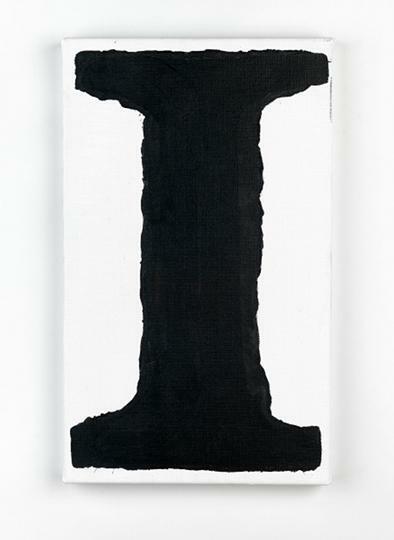 It is “I” as a self-portrait represented by language and font. 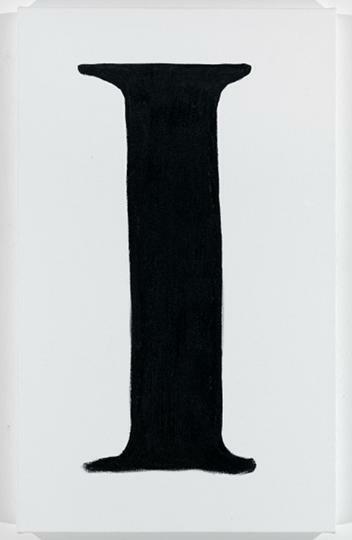 The letter represents the self and also has the vertical form of a human figure. The work presents a witty commentary on the self-portrait and its relation to identity that effaces individuality with a universal representation of it. 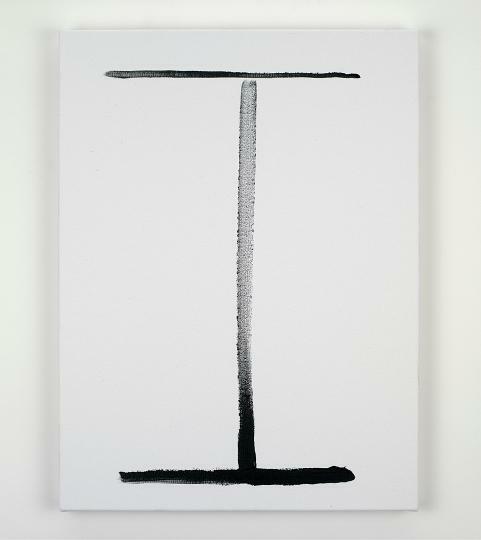 ‘I’ is the point at which subjective interiority and objective exteriority meet and overlap. Empowering yet simultaneously bewildering, Wallinger leads the viewer into a complex framework where it is revealed how we construct, and how we can construct an unfixed scenario of identities and ultimately possibilities, yet paradoxically in Wallinger’s work, the uncanny will always present a pattern. In Self Portrait the common denominator is ‘I’ or when grouped together a series of ‘I’s that then become a body of work, a populous, and then unnervingly (through metaphor) ‘us’. The transcendence of ‘I’ to becoming ‘us’ reveals the power of not only Wallinger’s art, but also the individual that views it.